I am so excited to tell you that I have a recipe for Sri Lankan hoppers coming up this weekend. But I felt that hopper pans themselves are so beautiful and unique that they should be spotlighted in a perfect piece installment. First, hoppers are a sort of rice flour crepe, sometimes made with an egg in the centre and usually eaten for breakfast. They are made by pouring batter into a heated, oiled pan but unlike flat pancakes, they are concave and crispy on the edges–achieved by making them in hopper pans. Hopper pans are incredibly simple in design and material, and they become so intricate over time. 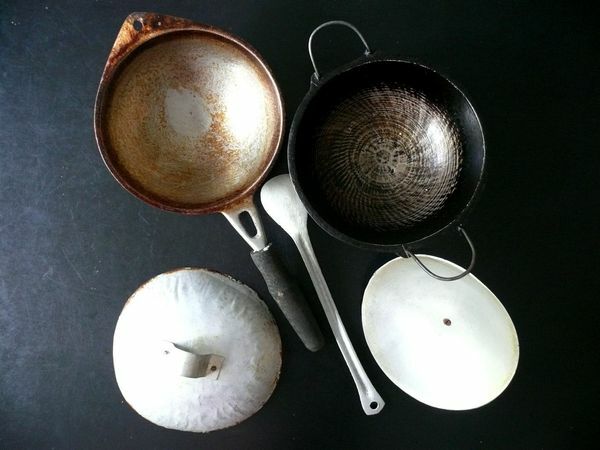 The best ones, seasoned with use, show the prettiest signs of wear as they subtly discolour. My aunt’s set (seen above) are made of the lightest metal and the lids are even thinner–you could bend them if you wanted to. The almost flat metal scraper is the perfect thing to loosen the crisp edges from the pan once the batter has set. These pans are available in large South Asian grocery and housewares stores (it helps if you have a “Little India” in your town) or they can be ordered online (non-stick versions are available readily, the non-coated, original kind are harder to find online). Owning two is ideal, so you can churn out twice as many. Just be sure to use them often to be rewarded with a patina! Thanks! They used to have the original metal ones with no coating but I guess not any more. I found one place that still seems to but will add your link too. Do you happen to know what traditional hopper pans are made of? From what I can tell it’s aluminum here but I didn’t think they would take on that shiny patina that I can see on yours. people do not talk about such topics. To the next! believe that you need to publish more about this issue, it might not be a taboo matter but usually people do not discuss such topics. Any advice on the best way to season a new aluminum hopper pan. Bought one on our recent rip to Sri Lanka but hopper get totally stuck! hi–yes! see the last paragraph of this post! Can I just say what a relief to find someone who really understands what they’re discussing online.